Written and Composed by J. Percy Ashdown. When, sitting lone and pensive, a maiden I espied. her features were fine, her smile was divine, but never a word she spoke. She only smiled most sweetly, and shook her head the while. The darling's French, I know it, so I softly sighed "Je t'aime." For, oh! she was fair, charmingly fair, etc. Again she smiled divinely, but not a word she said. "Elle compris!" I have it, she's Italian I feel sure. "lo t'amo!" then I whispered-she was silent as before. But, oh! she was fair, charmingly fair, etc. Yet still she never answered, she never even sighed. Then breathed in softest accents, yet she still made no reply. In Russian, Norse and Flemish-did she understand? not much. "I don't know what you're saying, for I'm deaf and dumb from birth." Yet, oh! 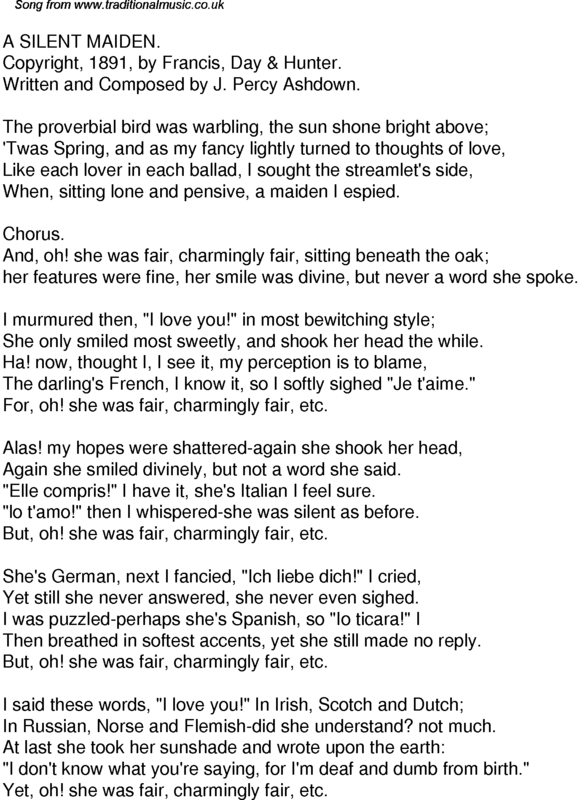 she was fair, charmingly fair, etc.